Which Bidet is Right for You? The Bidet Seat replaces your existing toilet seat, and we carry models to fit every toilet made. 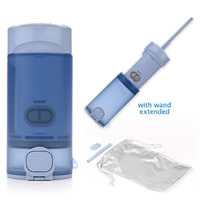 All models use the cold water line from your toilet (supplied), plug-in for electrical power and come complete with all of the necessary water fittings to provide a comfortable cleansing shower of warm water. The Bidet Seat was originally invented in the early 1960s by a doctor in Switzerland as an aid for his patients. The INAX Corporation of Japan acquired the patent, began refining the seat and introduced their first model to the public in 1964. Since then, over 50 million Bidet Seats have been sold around the world. Bidet Seats are vastly superior to the old style porcelain bidet fixture and much more affordable and convenient. In addition to overall personal hygiene, the right bidet seat can also provide comfort and convenience for individuals with diseases/disorders of the digestive tract, as well as disabilities resulting from Parkinson's Disease, Alzheimer's Disease, ALS, arthritis, multiple schlerosis or amputation of a limb, hand or finger. All of our Bidet Seats are equipped with anti-slam seats and lids, heated seats, adjustable temperature/pressure controls and are self-cleaning. Other options & features vary by brand/model. Visit our Bidet Seat Comparison page to learn more. Do You Have a 1-piece OR 2-piece Toilet? Two-piece toilets are the traditional toilet, with the separate bowl and tank joined together at installation. 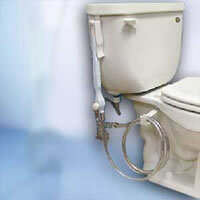 As the name suggests, 1-piece toilets come with the bowl and tank molded together in one piece. All of our models fit 2-piece toilets and most 1-piece toilets. If you have a 1-piece toilet with a curved back, please contact us with your make and model number. Some 1-piece toilets do not allow a good fit and may have to be replaced if you wish to use a bidet seat. Do You Need a Round OR Elongated Bidet Seat? Measure from bolt centerline to outside front edge of porcelain: Round Seat 16.5" & Elongated Seat 18.5"
Do You Prefer a Wireless Remote Control OR a Side Control Panel? The Wireless Remote Control offers the flexibility of being able to use with either hand and can be easily mounted. The Side Control Panel offers the convenience of having all of the operations enclosed in one unit. Do You Prefer White OR Beige? All Bidet Seats come in white; some models are also available in beige. The Bidet Attachment fits under your existing toilet seat (Bio Bidet BB-3000 being the exception, having both a seat and lid) and connects to a cold water line or hot & cold water lines, depending on the model. Warm water models require a hot water connection, which can usually be found under a nearby sink. These models come with an internal mixing valve to provide the perfect temperature for a warm water wash. 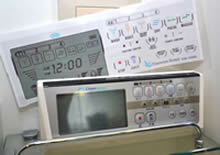 If a hot water source is not readily available, warm water models can be used with cold water only. Bidet Attachments do not use electricity, are relatively inexpensive and designed to last for many years. The Shower Bidet is simply a hand held sprayer, which is mounted next to your toilet and connected to your toilet's water supply line. One lever or button is pressed when water is needed, and a shut off valve closes when the unit is not in use. We have sold and tested many models, and today we only sell one model, the Olympia Shower Bidet, which is vastly superior to all others. Like Bidet Attachments, they can be connected to cold water or with an adaptor kit can provide warm or cold water cleansing. The Travel Bidet is battery operated and designed to deliver 20 seconds of cleansing. You can easily fill it at a sink with warm or cold water. When not in use, it folds up and fits into a small carrying case. Hygiene For Health has sold these since 1990, and they are a reliable cleansing & hygiene alternative to toilet paper when not at home. Your efforts were greatly appreciated and it was a pleasure doing business with you. ~ Barbara, C&M Ostomy Supplies, Inc. I wish I had thought of it years ago... I just love it!